You may be familiar with world-famous ‘Day of the Dead’ decorations, including elaborate sugar skulls and altars, but do you know how the holiday began? El Dia de los Muertos, or the Day of the Dead, is a holiday honoring deceased loved ones that is celebrated throughout Latin America between October 31st and November 2nd every year; however, its roots are deeply ingrained in Mexico. Rather than a somber occasion, the holiday is generally a lively, festive, and colorful remembrance of those who have passed on. Western Union (WU) has the story on the history behind the holiday and the tradition of how El Dia de Los Muertos is celebrated in Mexico. Back in Aztec times, deceased relatives were buried close to their family homes, often in a tomb underneath the house. There was a widespread belief in the afterlife, and it was important to people of the era to keep loved ancestors close by while they continued to exist in another realm. When Catholicism was introduced to Mexico, All Souls’ and All Saints’ Day traditions were interwoven into the existing culture, and the holiday evolved into what it is today. The current belief is that spirits return to the world of the living for one day to visit their families. The spirits of children and babies who have passed on are said to arrive on October 31st at midnight, and then adult spirits arrive the next day. El Dia de los Muertos shouldn’t be confused with Halloween, since they are different holidays with different origins. However, both holidays share the idea that spirits return on a certain day once a year to mingle with the living. El Dia de los Muertos celebrations have been evolving, however, as Halloween has become more popular in Mexico, and children now also dress up in costumes and go trick-or-treating (pedir Muertos). In many parts of Mexico, El Dia de los Muertos is celebrated with vibrant parades and colorful decorations, particularly in the southern destinations, including the states of Chiapas, Michoacan, and Oaxaca. Celebrations tend to be more on the solemn side in rural areas. Favorite foods of the deceased are usually cooked as an offering. Colorful calacas and calaveras (skeletons and skulls), generally sculpted out of sugar, wood, or stone, show up everywhere in the form of candy, dolls, and statues. These items are often placed on homemade altars in the family homes dedicated to those who have passed on. 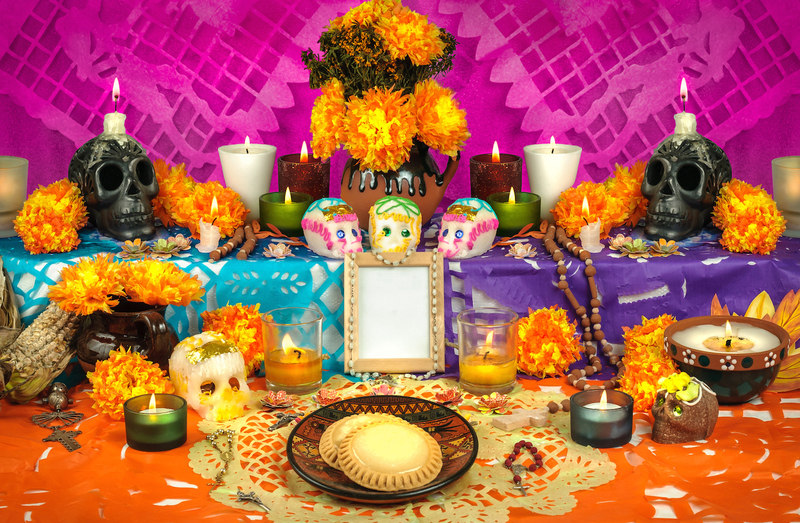 In Mexico, it’s also common to elaborately decorate the graves of loved ones and attend parties and vigils held in cemeteries that go on all night, complete with picnics and music. Some people even lay a path of flower petals from the cemetery back to their residences so that the spirits can find their way back home for the holiday. Late October/early November is a fantastic time to visit Mexico. Not only will you get to experience the unique El Dia de los Muertos celebrations firsthand, you’ll also be traveling on the off-season, so you may be able to enjoy fewer crowds, lower prices, and better service. You’ll also miss the rainy season, yet be able to enjoy the lush greenery all around you and pleasant temperatures. Have you ever experienced El Dia de los Muertos in Mexico? Share your experience with us in the comments!